NOTE: An asterisk ‘*’ indicates a platform we have vetted and found to be acceptable (or better). This is not to say that the other platforms are not acceptable, necessarily. AutoSoEZ, which is a product of GCommerce that offers some interesting fulfillment and ACES/PIES features. NOTE: An asterisk ‘*’ indicates a platform we have vetted and found to be acceptable (or better). This is not to say that the other platforms are not acceptable, necessarily. We don’t have an official recommendation, but we encourage anyone looking for systems to start at the top of our list and work down. Finally, here’s a list of hosted and open source systems that can be used for auto parts ecommerce. The order reflects our recommendation. 3dcart (Hosted), with a robust app marketplace that includes apps capable of adding year/make/model lookup, Quickbooks integration, etc. 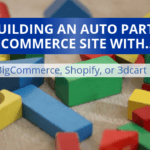 Shopify (Hosted) – A lot of auto part retailers utilize Shopify. The biggest problem with this system is that it lacks a true year-make-model lookup tool…you can “rig” something up, but it’s not nearly as good as the systems you’d find in the dedicated auto parts/accessories ecommerce platforms listed above. BigCommerce (Hosted) – If you don’t need year-make-model lookup, BigCommerce is excellent. 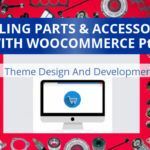 WooCommerce (Open Source) – While this system doesn’t scale well, it’s adequate for small ecommerce retailers selling a limited number of parts. Magento (Open Source)* – Beware that “free” software is often very expensive. 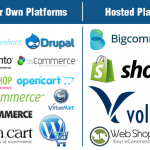 Volusion (Hosted) – Similar to BigCommerce, it lacks a true year-make-model lookup. Still, we’ve seen some companies use this platform to sell parts, and it’s a decent system for non-automotive parts ecommerce. As a general rule, we recommend sites designed specifically to sell auto parts over more general platforms. 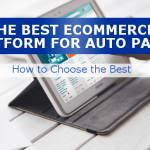 However, it’s easier than ever to build a cogent auto parts or accessories ecommerce site a hosted or open source platform. *Magento is expensive to build, expensive to maintain, and typically slow. We list it here because it’s compatible with a lot of 3rd party tools/platforms, but we recommend it as a last resort. Can I add my own data? If, for example, you’d like to sell both OEM parts and after-market parts, you’ll need to add your own part data. Can I customize my site’s content? Some systems offer unlimited content customization, others don’t support changes. If you can’t customize the META tags on a particular page of your website (for example), you may have problems with SEO. If you can’t add or update content on your site’s key landing pages, you may have trouble implementing conversion rate optimization, etc. Can I have a blog? Content marketing is a powerful tool, and success in content marketing starts with a simple and easy-to-use system for posting content to your site. Typically, this system is called a “blog,” but it can also be an articles section. If you can’t add content to your site, your content marketing options are very limited. Does your ecommerce system have one page checkout? While functional, a multi-page checkout process often reduces sales. One page checkout systems are best. What’s your average uptime for the last 3 months (with documentation)? Some auto parts ecommerce systems are plagued with technical problems, to the point where they can cause your website to go offline on a daily or weekly basis. Therefore, it’s important to ask about uptime. Please give me the URLs for five sites using your system. Once you’ve got this list you can a) contact each site owner/manager for a candid review of their platform and b) test the performance/function of each. Find sites using the same system as your own. Many ecommerce website providers put their name in the footer of all the sites they’ve created. If you figure out the website providers standard trademark message, you can search for it on Google (just be sure to search in quotes). Ask for live examples of features. If you’re promised a particular feature or function, ask to see a live example of it in action. Features or functions that aren’t live are often weeks or months away from production. Finally, once you choose an ecommerce website provider or system, remember that you’re likely going to be wedded to that company or system for years. Don’t rush into a relationship with the wrong provider – take your time. NOTE: If your company offers an ecommerce platform specifically dedicated to auto parts and you’re not listed here, please contact us and we will consider you for inclusion. Should You Redesign Your Auto Parts Website?